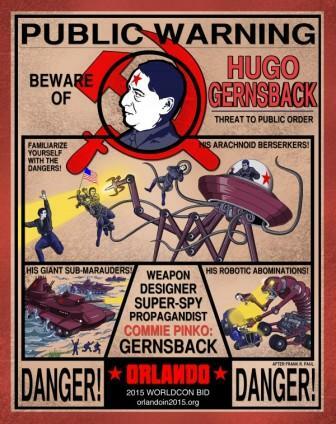 There’s also a new Frank Wu poster on the bid’s website. If you think it’s as “amazing” as Steve does I’m sure that will bring a smile to his face. This entry was posted in Worldcon and tagged Frank Wu, Orlando in 2015, Steve Davidson, Worldcon bids by Mike Glyer. Bookmark the permalink. The bid deserves support for that poster alone! Thank you, David! We think Frank went above and beyond on this one. I want a guarantee the hotel won’t go bankrupt after the bid wins, this time. I had NOTHING to do with the Fountainbleu’s troubles, – HONEST! We feel confident that Walt Disney World and their resorts are not going bankrupt anytime soon. It was Anti Fan who caused those hotel problems in Florida ….